This is the 5th of twenty-one lessons for design students, gathered from the combined experience of being a student, and teaching students. I will published one lesson each weekday until they’re done. I have to confess that I’ve forgotten many of the discussions I had with design tutors during my years of study. An exception is an important piece of advice from my first ever tutor, David Wagner: begin with a big idea, and sort out the details later. I am sure that you’ve received similar advice at various points of your studies. You already know that the best design projects are more than just a physical form, they require an underlying framework of ideas. Ideas give the form its whole purpose for being. The key however, is to carry your big ideas at the beginning of the semester all the way through to the end. It’s not enough to make a few half-hearted claims early on, then forget about them once you get down to the real business of floor plans and renders. The best projects develop a thorough hierarchy of ideas, each successive level informed by the proceeding one, from the first week to the last. Your early ideas will be about context, siting and massing. Your middle ideas will be about planning and form making. Your final ideas will be about materials, joinery and details. If done well, your ideas will take the form of a mature oak tree: from its deep tap roots that anchor your project, to a sturdy trunk, spreading branches and many, many leaves. The connections between each element is essential. So is the subservience of the later ideas (the leaves) to the earlier ones (the trunk). I tell my students that I won’t harass them if they can justify a decision with a well-articulated argument. I might debate a point, but I will treat your argument with the respect it deserves. I liked the look of it and It felt right are not good arguments. They belong in primary school art class, not a tertiary institution. A well-articulated argument exists in the realm of ideas, it allows you to trace each and every decision back to your very first day of semester. 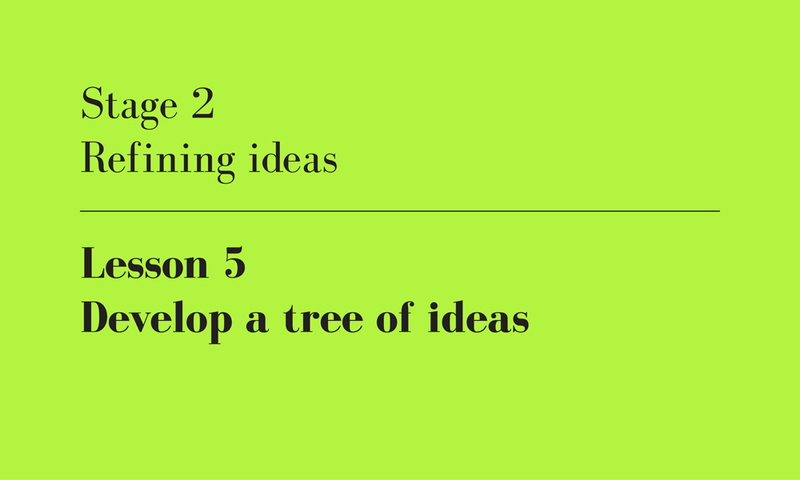 Develop a tree of ideas, author’s own image.